Exercise is essential to healthy life. It offers multiple rewards. It improves mood, lowers blood pressure, and improves blood cholesterol levels. It reduces the risk of cardiovascular disease, diabetes, and some cancers. Regular physical activity helps develop and maintain healthy bones, muscles, and joints. It relieves arthritis pain and keeps you younger than your years. If that weren’t enough, it helps control your weight. And many people learn to love exercise, once they have done it for a while. In order to stay healthy, people who don’t need to lose weight should get a minimum of 30 minutes of moderately intense physical activity every day, or nearly every day. It should preferably be aerobic activity (good for the cardiovascular system), such as brisk walking, running, cycling, or swimming. Vigorous work like raking and bagging leaves or washing the floor can also serve the purpose. If you need to lose weight, extend your routine to at least an hour a day, six or seven days a week. Do something that raises your heart rate and makes you breathe faster and sweat. A recently published study (JAMA v. 290: 1323-1330. 2003) found a direct correlation between weight loss at twelve months and duration of exercise. Women in this study who exercised less than 150 minutes a week (and who received instructions to follow a low fat, low calorie diet) lost about 5% of their total body weight, women who exercised 150 – 200 minutes a week lost 7% of their total body weight, and women who exercised more than 200 minutes a week lost almost 10% of their total body weight. In addition, those women who had the highest levels of exercise were still losing weight at the end of the study, whereas those women who exercised the least were quickly regaining lost weight. Almost all studies of weight loss find that there is a net regain in weight after the first six months, so that the usual goal is to minimize that weight regain in order to maintain the weight loss benefits of the intervention. This study finds that exercise for more than 200 minutes a week may be one of the few interventions that keeps on delivering weight loss for a full year. You don’t need to pack all your exercise into one session. Short bouts of exercise during the course of the day have an additive benefit, 3 10-minute or 20-minute sessions will do you as much good as one longer session. 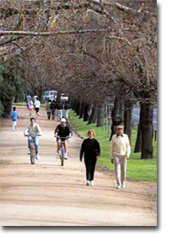 Walking is the most practical, accessible exercise as well as the safest. But casual strolling is not enough. Aim for a brisk pace, about 3.5 to 4 miles per hour (so you walk a mile in 15 to 17 minutes). If you are just starting a walking program, check your pace by walking on a treadmill or timing yourself as you walk a measured mile — typically four times around a school track, for example. If you haven’t been exercising it may take you a few weeks to get used to walking briskly. Make exercise a habit. Walk whenever possible, in preference to driving or taking a bus. Skip the escalator or elevator and take the stairs. If you are very overweight, have always been sedentary, or are over 70, you may find it hard to get going. A walking pace of 3.5 to 4 miles an hour may seem impossible to achieve. But keep trying. Do what you can do. It is never too late to start exercising and reaping the rewards. As you get accustomed to a routine, add some strength training with free weights or weight machines. This is especially important for bone health as you grow older. If you have never done any weight training a few lessons can be an excellent investment to get you started. Elsewhere on this website we have more information on the psychological benefits of exercise.